Sandeepany symbolizes the perfect kindling and the kindling of Perfection in the hearts of men. 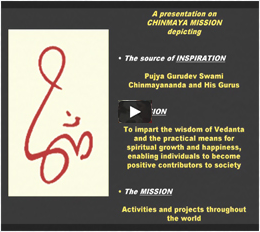 Chinmaya Mission’s Vedanta institutes for spiritual studies were named by founder Swami Chinmayananda as ‘Sandeepany’-s (pronounced saan-dee-panee). He said, ‘Sandeepany symbolizes the perfect kindling and the kindling of Perfection in the hearts of men.’ In ancient times, the great sage, Maharishi Sandeepani, headed a gurukula, where spiritual knowledge, scriptural teachings, martial arts, and all aspects of learning were imparted to resident disciples. Gurukulas were much more than today’s boarding school and the students stayed under the tutelage, protection, and nurturing of their guru for approximately ten years. Students and their guru resided together as a family. Maharishi Sandeepani’s most famed disciple was none other than Lord Krishna. Swami Chinmayananda thus chose 'Sandeepany' as Chinmaya Mission's first Vedantic learning and spiritual training academy in Mumbai, India. This title later came to be used generically for all of the Mission's Vedantic institutes, which sprouted in various parts of India and offer two-year residential training in the respective regional languages. Swami Chinmayananda established seminaries for the study of Vedanta where students could learn not only the concepts in the scriptures, but could also withdraw temporarily from worldly life, internalise the teaching for a few years, and prepare themselves for passing on the practical application of Vedanta to others. Studies at a Sandeepany institute are intense and intensive to say the least. Fully dedicated to the disciples' spiritual education and growth, the two-year residential course is standard in its syllabus and traditional in its teaching method. Disciples learn Advaita Vedanta based on various scriptural texts, the primary three being the Prasthana-traya, i.e. the major Upanishads, Bhagavad-gita, and the Brahma Sutras. These texts are studied based on the respective commentary by Adi Shankaracharya. Studies include Sanskrit grammar, Vedic chanting, select Vedantic introductory texts, devotional masterpieces, and original compositions of various spiritual masters. Spiritual seekers, regardless of their upbringing and faith, are carefully selected and interviewed before being accepted to undergo the intensive, residential training in Vedic literature. A university degree is a mandatory prerequisite. Married students must have their spouse's permission to join, and unmarried students must have their parents' permission to join. Sandeepany Sadhanalaya Mumbai Established in 1963, Sandeepany Sadhanalaya in Powai, Mumbai was the first institute of Vedanta formed by Swami Chinmayananda. It commenced with Swami Chinmayananda himself as the Acharya (teacher). The two-year residential Vedanta course in English now commences and concludes at Sandeepany Sadhanalaya on the auspicious day of Ganesha Chaturthi. A year after its conclusion, another course begins. The 16th batch of spiritual students graduated on September 5, 2016. Chinmaya Sandeepany, Kolhapur is situated between Toap & Sambhapur villages, about 13 km away from the main city of Kolhapur, in Maharashtra. In January 1991, Swami Purushottamananda met Swami Chinmayananda in Mumbai to seek blessings and guidance to develop the land for a regional Sandeepany in Marathi. Though Gurudev could not physically inaugurate it, the ashram, spread over eight acres, became the Vedanta gurukula in Marathi. The first Vedanta course was inaugurated on the auspicious Guru Poornima day in July 2008. Sandeepany in the Himalayas was named by Swami Chinmayananda as 'Sandeepany HIM.' Situated and administered by Chinmaya Tapovan Trust in Sidhbari, Himachal Pradesh, this is the second of Chinmaya Mission's Vedantic institutes in India. All other course factors remaining the same, the only difference here is the language, teaching medium being Hindi instead of English. The Sandeepany HIM Vedanta course thus trains students to serve Mission centres in Hindi-speaking areas. Swami Tejomayananda (then Brahmachari Vivek Chaitanya) was the Acharya of Sandeepany HIM's first Vedanta course, which was inaugurated in April 1981. Sandeepany West, also known as Krishnalaya, conducted the two-year Vedanta course in English in 1979. Administered by Chinmaya Mission West (CMW) in its scenic headquarters and ashram in Piercy, in Northern California, it was the first course of its kind outside of India. With more students wanting to join in India, including students from outside its borders, the English Vedanta course was permanently established in the one location of Sandeepany in Mumbai.